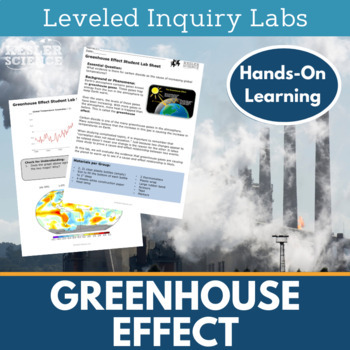 In this lab, students will model the effects of greenhouse gases, then analyze and interpret graphs and maps to determine how the greenhouse effect is changing Earth’s temperature. 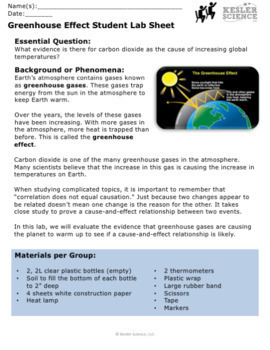 - Teacher Resource Pages - prep time, standards/objectives, teacher directions, materials, and additional resources. - CER Conclusion and Reflection Questions - Claim, Evidence, and Reasoning statements along with 3 reflection questions per lab. - All pages are EDITABLE. Dependent Student Lab- A complete lab. This level is written with a combination of procedural instructions and inquiry questions. They are moderately student-centered with guided inquiry questions throughout the lab. Suggested for on-level learners. Modified Student Lab - A complete lab. This level provides the most structured lab experience. 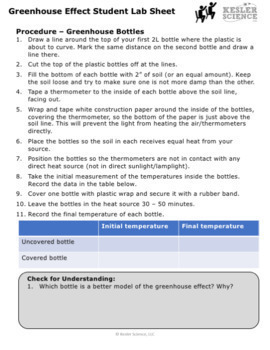 The lessons may eliminate parts of the lab and change the questioning to include sentence stems or multiple choice questions. Suggested for learners with modifications. Independent Student Lab - A complete lab. This level is the most student-centered experience. Suggestions are made for the students to get started, but most of the decisions will be student-centered. The students will be responsible for most aspects of the lab and will have the least guidance. Suggested for advanced learners. 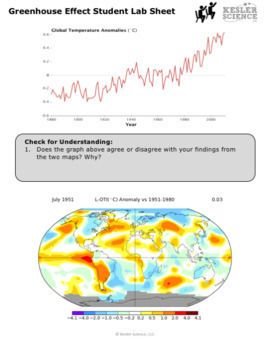 ESS3-5 - Ask questions to clarify evidence of the factors that have caused the rise in global temperatures over the past century. Save precious prep time and get back to teaching. All of the work hard work has been done for you. Go have some fun with those students! Copyright © Chris Kesler. All rights reserved by the author. This product is to be used by the original downloader only. Copying for more than one teacher, classroom, department, school, or school system is prohibited. This product may not be distributed or displayed digitally for public view. Failure to comply is a copyright infringement and a violation of the Digital Millennium Copyright Act (DMCA). Clipart and elements found in this PDF are copyrighted and cannot be extracted and used outside of this file without permission or license. Intended for classroom and personal use ONLY.